Rokurou is a cheerful and kind person who takes good care of people that he likes or admired. Rokurou belongs to the Rangetsu family. The family has a tradition that involves passing down a sacred and secret sword technique through generations. 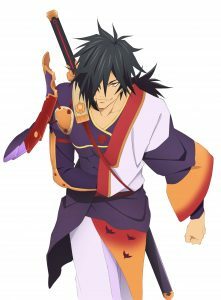 During the events of Scarlet Night, Rokurou became a Daemon, but was able to regain most of his humanity. He has an older brother named Shigure, who is a legate for the Abbey and also the head of the Rangetsu family. Although he employs quick attacks, most of them only deal short-range damage. Therefore, using Soul Break enables Rokurou to counter the enemy while they are still about to strike. This appeals to players who desire a character that relies on countering enemies. As a counter, his Soul Break must be used to retaliate on an aggressive enemy. “Ni no Kata: Daichi” This arte sets up a trap to catch enemies, this also affects enemies even when Rokurou is down. In addition, this enables sets up for chaining combos. “Kamakake” A Base Arte that inflicts paralysis on enemies, allowing Rokurou to land another arte or two. “San no Kata: Mizuchi” A Water-elemental Arcane Arte that makes it easy to chain combos because of its long-range. Since it launches an enemy with the first arte, it becomes easier to follow up with the rest of the recomended artes. This chain specializes on artes that deal multiple hits, which allow you incapacitate enemies for a long period of time.